Most vintage collectors know Goudey for its artistic 1933 debut, the "Big League Gum" set of 240 baseball cards. 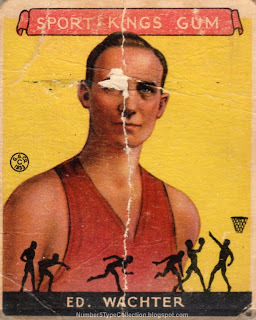 Less regarded, but arguably more ground-breaking, is today's 48-card multi-sport set, whose #5 features one of basketball's earliest pros, Ed Wachter. Of course, my card looks more like pirate Ed Wachter, yarrrrr! (I should make an eye-patch version.) My favorite design element is the silhouetted players at the foot of each card. 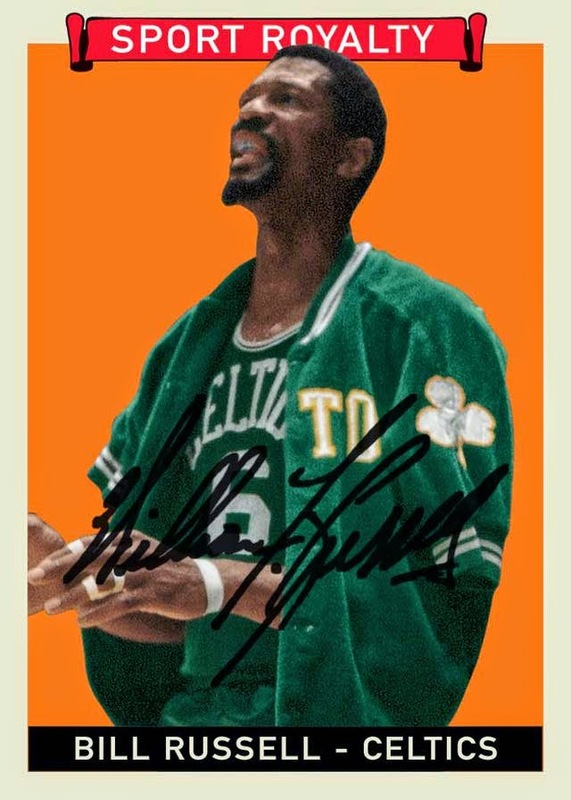 I appreciate that Sport Kings were resurrected as "Sport Royalty" in recent years to honor multi-sport stars as inserts in otherwise single-sport issues. The original Sport Kings set includes 3 baseball players, Babe Ruth, Ty Cobb, and Carl Hubbell. A wide variety of sports make up the others, including another "Babe," lady golfer Didrickson, its only female athlete. Jim Thorpe appears as a football player, along with gridiron legends like Knute Rockne and Red Grange. It's not easy to read my card's worn bio, but here's the first sentence. 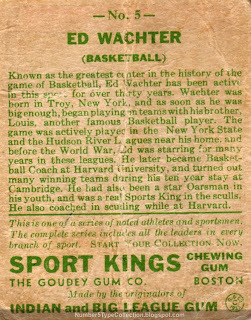 "Known as the greatest center in the history of the game of Basketball, Ed Wachter has been active in this sport for over thirty years." 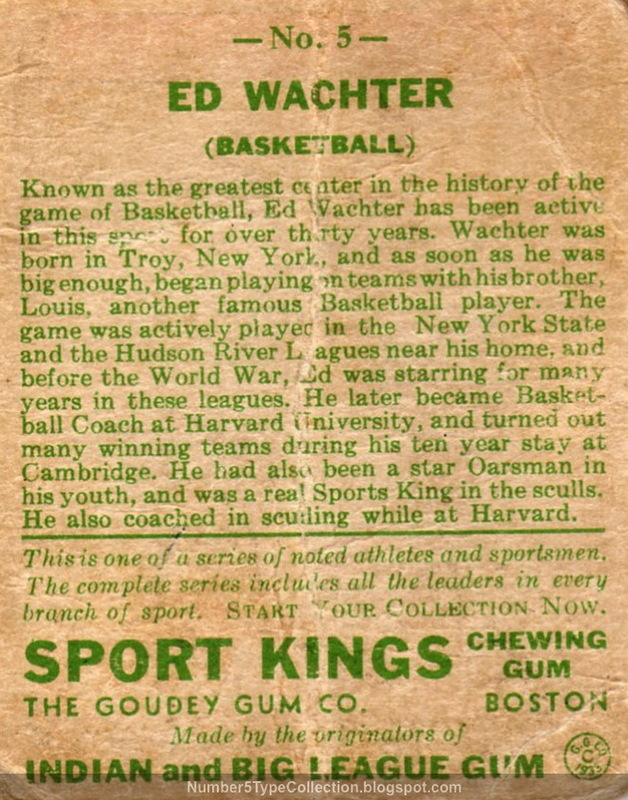 In short, Ed Wachter preceded better-known centers George Mikan and Bill Russell as their generation's preeminent centers. Ed's Wikipedia page (as of writing) is shorter than the card text, which seems a shame, given his apparent stature. At least the basketball Hall of Fame added Ed in 1961! Find a more detailed Sport Kings Gum profile at Obaks.com. Value: A friend sent this #5 gratis, which is a pretty sweet gift. Low-grade Wachter cards run $10 to $20, depending on how close to a pirate Ed looks. Yarrrrr! Fake / reprints: There are definitely full set and star card reprints out there. I doubt anyone did one of Wachter specifically, but it's possible someone faked the complete run. As always, be careful when buying pre-war cards and know your dealer!